I love Star Wars. And notice that I didn't put those familiar words in quotes, because I'm not just talking about 1977's "Star Wars." No, I'm talking about the expansive franchise juggernaut that is Star Wars. All of it. Okay, nearly all of it. I'm not the rare Star Wars that's able to reconcile the drastically different…priorities is a word…of the original and prequel trilogies. Even though I know the difference between Plo Koon and Oppo Rancisis, my love cannot travel across the border that's in place separating Han and friends from the adventures of Lil' Ani. I'm 30, this is how I'm hard-wired. And yes, I'm only 30 years old. I'm a year and change younger than the last movie in the original trilogy, and that makes me feel like a fan caught between two generations. I'm not part of the original generation that saw any of the films in the theaters, but I'm also not a part of the next generation of fans that first experienced the films in either the THX remastered VHS tapes (seems like an oxymoron now, right?) or 1997 rereleases. I first discovered Star Wars and "Star Wars" in the fall of 1990, smack dab in the middle of the only dip in popularity the franchise has ever endured. My then teenage sister's then boyfriend changed my life by renting "Star Wars" from Video Depot in Hendersonville, Tennessee. Once that videocassette was popped into the VCR, I was hooked—and totally alone. There were no action figures around and I was still months away from the release of "Heir to the Empire"—an Expanded Universe novel that was definitely too mature for me, but that didn't stop me from skimming through it looking for familiar words like "Skywalker" and "lightsaber." I had my sister's old "Star Wars" figures and a big stack of Marvel's original "Star Wars" comics from the late '70s. Yep, that's right. That boyfriend gave me all of his "Star Wars" comics. Maybe it was nerd altruism or maybe it was just to impress my big sister; either way, my romance with both comics and Star Wars lived on well after that teenage one bit the dust. And that brings us to this adventure. With Star Wars' comic book rights reverting from Dark Horse Comics back to Marvel next year, I think now's the perfect time to pull those beat up comics off the shelf and look at just what Marvel did the first time around. Things are going to start off normal with the six-part adaptation of "Star Wars," and then, well, a big green bounty hunter bunny debuts pretty much immediately after that. Things are gonna get weird. But before things get weird, things have to begin. First, before we get to "Wormie" and the most puzzling use of a beverage I've ever seen, I have to talk about how this all happened. Sean Howe's excellent "Marvel Comics: The Untold Story" has a brief rundown of the events that led to the publisher landing the comic book rights to a rando sci-fi movie starring a bunch of nobodies. As recounted in the book, Charlie Lippincott, a marketing consultant working with "Star Wars," approached Roy Thomas—former Editor-in-Chief of Marvel—about getting this upstart sci-fi flick adapted into a comic book. Stan Lee had already turned down the offer, but Thomas saw an opportunity. Marvel was already snatching up copyrights left and right (Spider-Woman and Ms. Marvel are two amazing characters that were also defensive moves against the competition) and publishing licensed series like "Godzilla" and "Tarzan." Marvel reconsidered and decided to take a chance on "Star Wars." That chance would pay off when the comic went into multiple printings (I was gifted a beat up reprint of #1, which I cherish to this day) and saved Planet Marvel from the Financial Ruin Death Star. 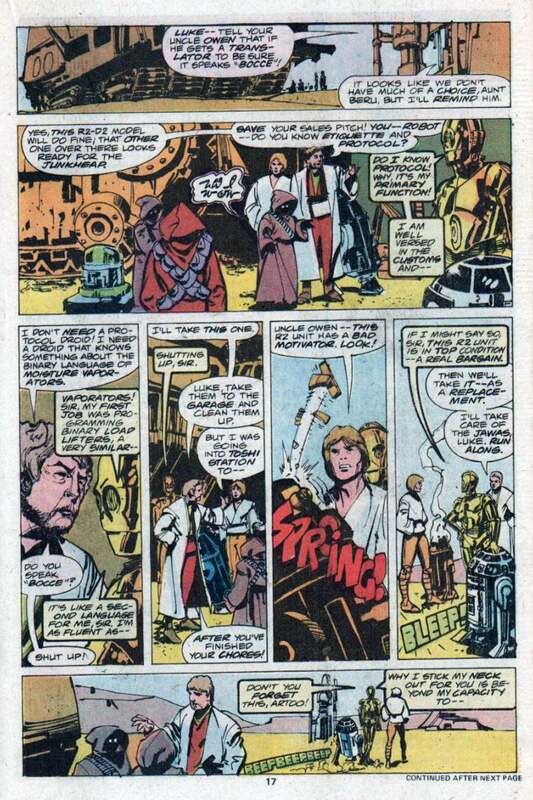 For the creative team, George Lucas went with heavy-hitters to show off cred in the comic book world. As J.W. Rinzler's entertaining and literally heavy "The Making of Star Wars" book details, Lucas felt that getting in good with the burgeoning comic con crowd could guarantee positive word of mouth for their weirdo space fantasy. Roy Thomas had written pretty much every Marvel comic around, from "Avengers" to "X-Men"; he'd also recently worked with Howard Chaykin on a brief run on "Marvel Premiere" featuring a character interestingly named Monark Starstalker. 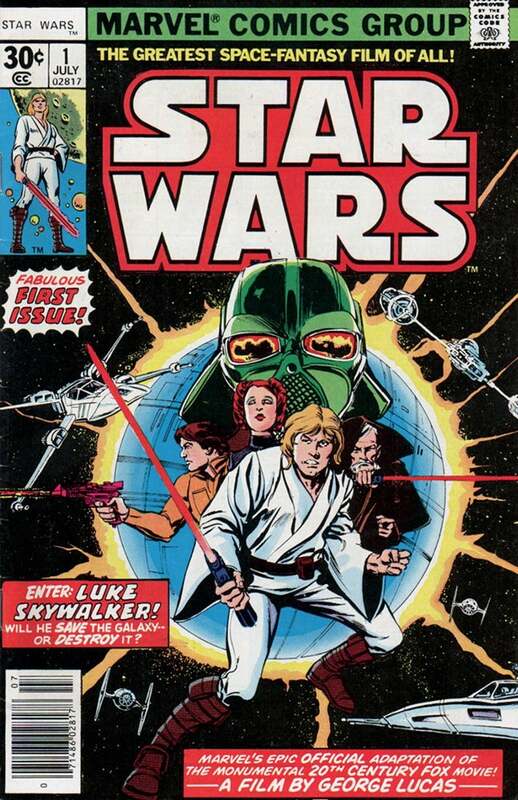 Thomas and Chaykin would lend name value to "Star Wars," which was something it needed to get readers seeing as how the first three issues would be released before "A long time ago in a galaxy far, far away…." would appear on screens. And then there's the issue itself. Look, part of the point of this column is to uncover the forgotten and overlooked wackiness of what's essentially the wild west of Star Wars stories. I'm gonna gently poke fun at this series while also giving props where they are most certainly do (like Walt Simonson's run, you guys!). There's gonna be a lot of retroactively creepy stuff between Luke and Leia, and there's gonna be a Jedi Knight inexplicably named Don-Wan Kihotay. I know that sounds super fun, but we are just not there yet. This issue is not one of the crazy ones. This issue is solid. You can tell this issue's going to be solid just by looking at that fantastic Howard Chaykin cover. It's modified from a poster the artist did for "Star Wars" just a short time before landing this penciling gig. I mean, yes, there are some weird things about it. Darth Vader is green and has fiery eyes. Princess Leia has no arms and appears to be asleep. Han Solo proves he can look like a scoundrel even when wearing an orange jumpsuit and holding a magenta blaster. But seriously, this cover cuts through those inaccuracies and connects with the reader on such a visceral level that… okay, I didn't even notice until just now that the entire Death Star appears to be on fire. The first page mashes up a number of the film's iconic opening moments. 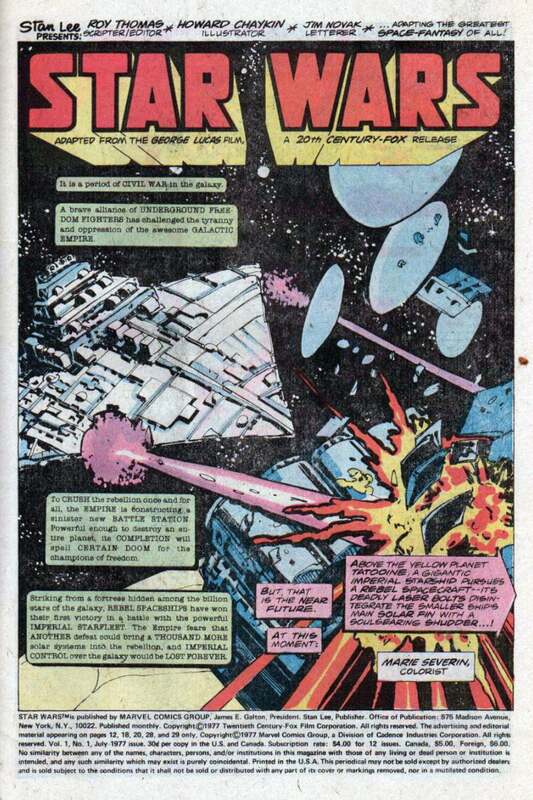 You get the bold "STAR WARS" up top, a modified version of the opening crawl text scattered throughout the page in green captions, and a shot of a Star Destroyer blowing away the back end of the Tantive IV. With the opening out of the way, the action picks up at a breakneck pace. 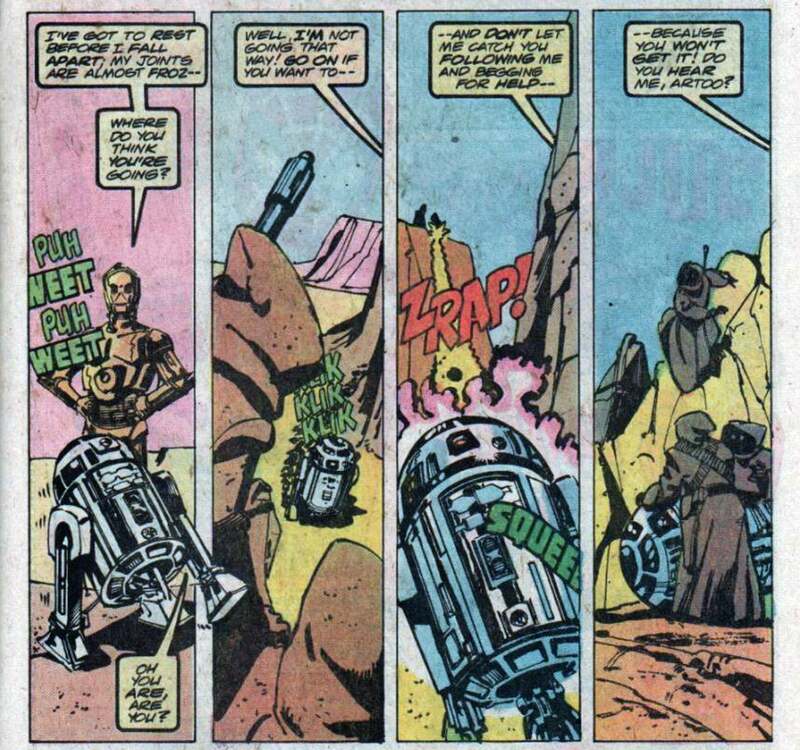 We get introduced to R2-D2 and C-3PO's vaudevillian bickering as they weave their way through laser fire, and we get our first "huh?" moment at the bottom of page two when we meet a youngster in a bucket hat named Luke Skywalker. Obsessive "Star Wars" fans know that we're meeting Luke way too early; he doesn't pop up for another 12 minutes in the movie, well after Artoo and Threepio have crash landed on Tatooine (implausibly close to the one of two living Jedi Knights and the son of the villain they just escaped). 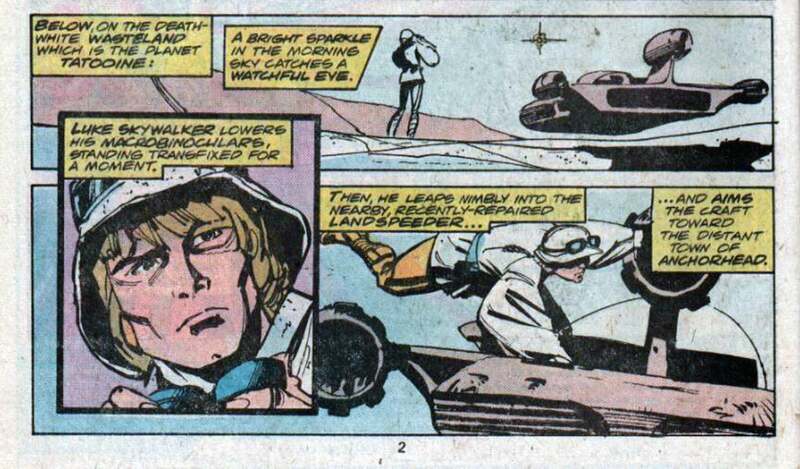 We get this super early peek at Luke because the first six issues of "Star Wars" were adapted from the film's shooting script. That means we get a lot of scenes, characters, and—in Luke's case—unfortunate nicknames that were cut from the film. Wormie. Come on, you just know Mark Hamill let out a heavy sigh of relief once he realized that nickname had been cut from the film. Luke already gets enough guff for that "I was going to Tosche Station to pick up some power converters" whiney line; can you imagine how relentless people would be about the nickname Wormie? But here it is, in all its glory, uttered by Camie to her pal Fixer. And yep, Camie and Fixer are two characters performed by real actors that were cut from the film and had to face decades of "yeah, right" reactions when they told people they were in "Star Wars." Much respect to Koo Stark and Anthony Forrest for your years of putting up with disbelief. You now have action figures, because it's Star Wars and of course you do. Back on the Rebel spacecraft, we meet this story's princess—and she takes no prisoners! 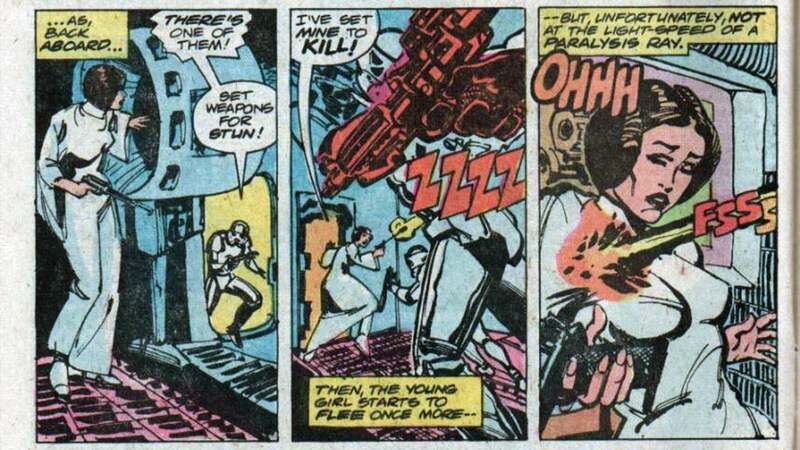 Seriously, movie Princess Leia doesn't mess around in this scene, but comic Princess Leia's out for blood. 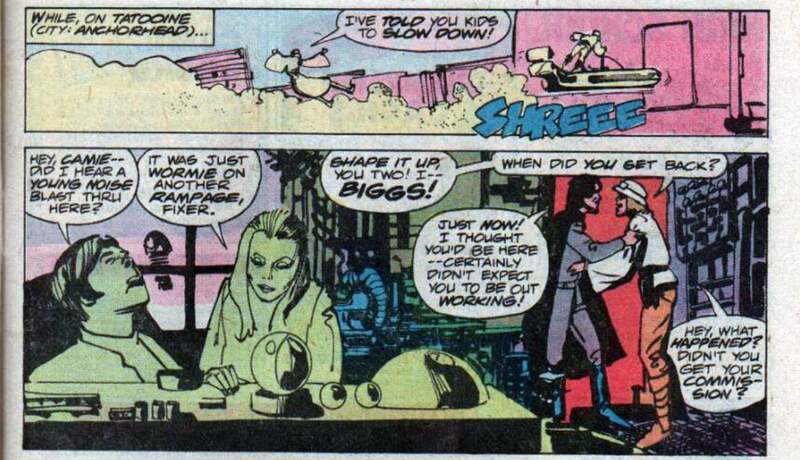 We don't get much more with Leia in this issue, and she's only referred to as "your highness." After Luke's Tosche Station heart-to-heart with Biggs, the story cuts to a scene with the bad guys in "a soulless Imperial conference room, somewhere in the galaxy," a scene that comes much later in the film. That's totally okay, because that means we get to see the infamous choking scene a whole issue early—and it's possibly even cooler in the comic. Yep, Vader chokes Admiral Motti while using the Force to get himself a drink. Dude lifts a drink—I have my fingers crossed it's blue chocolate milk—to his gloved hand and just uses it as a prop to throw massive shade at Admiral Motti (whose likeness appears to have been switched out with Commander Tagge, for those of you into super specific details like that). Vader can't drink that through his big mask, unless he just dumps food and drinks in through his faceplate grate, catching what he can with his mouth. Oh, the mental images. 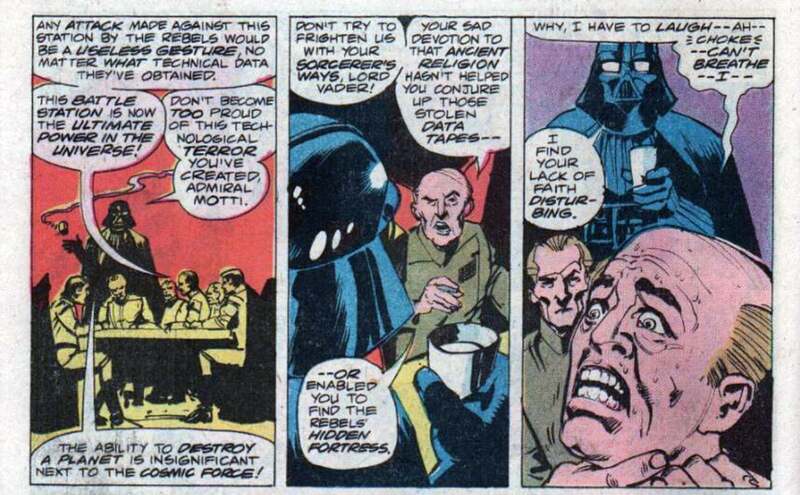 Still, that's a pretty boss move on Vader's part. Choking insubordinate officers ain't no thing for him. The story heads back to Tatooine for maybe the best example of just how compressed this storytelling is. A scene that takes almost four minutes to play out on screen gets packed into seven panels. There's a lot of ground to cover in "Star Wars," but this feels a tad compressed even by 1970s standards. Chaykin manages to keep the storytelling clear and fluid, but you can kinda tell that letterer Jim Novak wishes writer Roy Thomas had cut out more of the script's dialogue. Well, Thomas actually did cut some dialogue, and by "some" I mean two crucial letters. Reading that truncated distress call, there's a joke to be made about Pimp Leia but it feels like low hanging fruit, you know? I don't know why Thomas shorted "hope," maybe the most crucial word in the message, but hey, it happened and we can't ignore it. The message propels the story into its final pages as Sandtroopers pick up the droids' trail and Artoo gets anxious about making a rendezvous with the mysterious Obi-Wan Kenobi. We also get one page of Wormie's dinner with Aunt Beru and Uncle Owen, where Chaykin really lets the facial expressions fly. I love how utterly chillaxed Luke looks in that second panel. Yeah, he's telling his uncle that he thinks the droid is stolen, but it looks like he's telling us about the "totally rad waves down at the shore, bro." I might love Uncle Owen's face in the next panel even more; that's one stern looking uncle! "The only waves you'll see are your friends saying goodbye after they make something of themselves!" 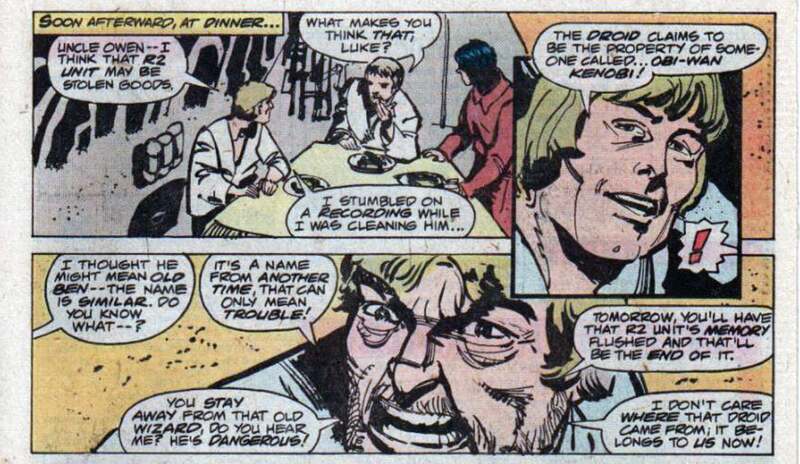 Please start an Uncle Owen Harshes Luke's Vibe meme based on these two panels. NEXT: "Six Against The Galaxy"